Size UK 6 – UK 26 And Custom Size Available, Please Kindly Check the US Size Then Place The Order. ,Solovedress Specialized in Wedding Dress Evening Dress Prom Dress Party Dress Cocktail Dress And Other Special Occasion Dress. 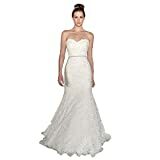 Browse large selection of dresses for your special occasion.You will surely be attracted by this sassy and flattering wedding dress at the first sight. beading and sequin.The skirt moves graciously with you when you walk, dance gently sweeping the floor.